The Sisters community is invited to gather at Village Green Park on Thursday, July 19, 5:30 to 8 p.m., to create rhythm and song together, meet new and old friends, and share a free dinner. The relationship-building-through-play event is the first of three fun and free evenings being sponsored by Citizens4Community as part of a grant from the Ford Family Foundation. 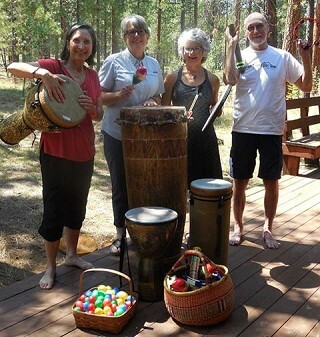 Jodi Winnwalker, a music therapist and owner of Earthtones Northwest, will facilitate the rhythm and song circle at the July 19 event. On August 15, line dancing at the Sisters-Camp Sherman Fire District's community hall will bring people together to learn the "Cupid Shuffle" with Jane Paxson, who learned it four years ago at a restaurant in Sacramento. Paxson loves it because "it is good exercise," in addition to being fun. Attendees will also be able to experience a variety of other fun dances with demonstrations and participation, including Hawaiian and circle dances. On September 16, everyone has the opportunity to join the local Latino community at a fiesta to celebrate Mexican Independence Day at Village Green Park with food, music, and sharing of cultures. Paxson is formulating the evening of dancing on August 15, and Wendy Birnbaum is working with the Latino community to create the September 16 fiesta. The three women are working supportively together on all of the events. The main goal when the women started out was to provide opportunities for community building by creating events designed to be interactive, rather than passive, like lectures and concerts. The rhythm and song event on July 19 will highlight musicians of different colors, cultures, and sounds who will participate right along with community members. A factor identified during the recent visioning process is that the local Latino community, numbering 25-30 families, would like to be more included in the Sisters community. They have been coming up with ideas for how to more fully embrace the community. It is hoped that as the Latino community gets involved in the rhythm and dancing events, everyone will join in the September 16 fiesta. "Our desire is to create a convergence of nonverbal interactive events where we can gather all of the community together in inclusionary, non-threatening ways," Birnbaum summarized. Musicians who will share their talents and instruments at the July 19 rhythm and song evening include: Maggie Johnson, silver flute; Cameron and Tree, gongs, singing bowls, and song; Kirk Olsen, African guitar; Shannon Mokuahi Rackowski, traditional Hawaiian instruments and dance; Katie Cavanaugh, Native American flute; and Annemarie Crosier, African drum, song, and dance. There may be additional musicians sharing accordion music and ukuleles. Many hands make light work, and that is the spirit behind these events geared toward participatory events that can be enjoyed by everyone, whether they choose to join in or observe. The hoped-for result is a healthy, interconnected community coming together for fun and relationship building. Winnwalker described the meetings held to plan these programs as being "collaborative, with everyone supporting each other." Program committee member Birnbaum described the process: "It has been such a joy to get to know everybody." And Paxson pointed out, "Fun and Wendy go together." Fire Chief Roger Johnson is supporting the events by providing "security" in the form of fire department personnel for all three gatherings. Melvin's by Newport Avenue Market will provide the free dinner, planning to feed 200 people with hot dogs, salads, cookies, lemonade and water. The partners for the July 19 event include the Ford Family Foundation, Citizens4Community, Sisters Park & Recreation District, Melvin's by Newport Avenue Market, Umbala Creations and Earthtones Northwest. The organizers wish to offer a special thanks to Suttle Tea and Garth and Kit Tosello for serving as their official meeting place for their many planning sessions. The evening is casual, so dress comfortably to enable freedom of movement. Bring lawn chairs or blankets to sit on. Dogs are welcome, but organizers request that they be leashed. No alcoholic beverages are allowed in the park.